South Africa’s role in Sri Lanka’s peace and reconciliation process appears to have metamorphosed from playing honest broker to simply sharing its experience and offering help. Their latest posture emerged when the man who is next in line for that country’s presidency, much respected Cyril Ramaphosa arrived in Colombo last Monday heading a top level delegation. He is now acting President. President Jacob Zuma named him Special Envoy to Sri Lanka. Zuma himself is ill and is hospitalised. Before getting down to business, Ramaphosa had some strong words to say. “Your Excellency, We are here at the invitation of your Government. If you don’t like our role, we are prepared to withdraw. We have to protect the dignity of our country,” he told President Mahinda Rajapaksa. During talks earlier with a Sri Lanka Government delegation, Ramaphosa told the President, he had asked External Affairs Minister G.L. Peiris to clarify Sri Lanka’s position. He had agreed to do so. This was because they were hurt by cynical remarks by Government members. Ramaphosa also made clear that their initiatives should not in any way be misunderstood as trying to elbow out India. Rajapaksa responded saying, “Sri Lanka is receiving the support of India in addressing the national question.” With continued assistance, he said, that even issues in the north could be settled. He declared Sri Lanka “is open to learn from the experience of other nations under similar circumstances”. One such remark referred to by Ramaphosa was that by Minister Wimal Weerawansa, leader of the National Freedom Front (NFF). One of the NFF’s 12-point “reform proposals” is to urge the Government not to have any “outside involvement” in the country’s peace and reconciliation process. In remarks made to the media over the South African delegation’s visit, he claimed he had been told by UPFA leaders that “they were coming as tourists.” Another minister who strongly opposed the visit was Jathika Hela Urumaya (JHU) General Secretary Patali Champika Ranawaka. He warned there would be serious consequences if there was foreign involvement. External Affairs Minister (EAM) Peiris left for India after Ramaphosa’s departure. Sri Lanka’s current official position was contained in a statement acting EAM, Neomal Perera made in Parliament on Thursday. That was in response to a question raised by Janatha Vimukthi Peramuna (JVP) leader Anura Kumara Dissanayake. He said President Zuma had assigned Ramaphosa “to share South Africa’s experience of the Truth and Reconciliation Commission (TRC) process in order to explore the possibility of Sri Lanka adopting a similar mechanism.” He made clear there was no “mediator role” for South Africa. Only a week earlier, Media Minister Keheliya Rambukwella told a news conference (following the weekly ministerial meeting on July 3) that Ramaphosa was coming to Sri Lanka “as a tourist” and there was “no agenda or official programme.” Whether such public pronouncements are part of Government’s well thought out strategy or not seems unclear though its credibility is eroded every week through this news conference. It was not so long ago, Rambukwella declared Sri Lanka was violating US oil sanctions on Iran and insisted “I know the gravity of what I am saying.” Barely 24 hours later, it was denied by the External Affairs Ministry. President Rajapaksa was livid that Rambukwella’s remarks had placed the Government in a difficult position. So, it’s official now. The Government of Sri Lanka is only keen to set up its own Truth and Reconciliation Commission (TRC) drawing on the South African experience. That is pointedly to deal with matters arising out of the ongoing UN Human Rights Council international investigation into alleged war crimes. In South Africa, those responsible for apartheid crimes and made confessions to the TRC, were granted amnesty after scrutiny. The question, however, remains whether the Government’s latest move is too little too late. A member of South Africa's acting President Cyril Ramaphosa is reported to have tweeted: "Meeting with President Mahinda Rajapaksa. He was in such a rush he forgot to do his tie!." That was for Ramaphosa’s meeting with President Mahinda Rajapaksa at Temple Trees last Monday. Photo credit: Sudath Silva - Presidential Secretariat. If that is just one issue, another is why there were so much of secret diplomatic exchanges between Colombo and Pretoria. A Sri Lanka delegation could have learnt of the workings of the South African TRC as easily, as a delegation visiting that country. This is what clouds the Colombo-Pretoria dialogue in the past several months or more. On February 13, President Zuma told his country’s Parliament during the state of the nation address, “Following requests from Sri Lanka and South Sudan for assistance in bringing about peace and reconciliation, Mr Cyril Ramaphosa, has been appointed as South Africa’s Special Envoy to the two countries. His expertise in conflict resolution and negotiations as well as our country’s experience in this regard, will greatly assist the two countries to resolve their problems…” It is thus clear from Zuma’s remarks that assistance was sought to bring “about peace and reconciliation” and not for the setting up of a Truth and Reconciliation Commission (TRC) alone. “What do you mean by a South African “initiative”? Could you elaborate? “I cannot say anything more. How it will develop only time will tell. It will of course depend on the Government and the TNA. “Would a South African dialogue go beyond a Truth and Reconciliation Commission? “A Truth and Reconciliation Commission, if at all, would be the last thing in the dialogue. It would be the final component. “What is the position of the 13th Amendment to the Constitution in such a dialogue? Neither President Zuma’s remarks to his country’s Parliament or TNA leader Sampanthan’s assertions to the Sunday Times were contested by the UPFA Government then. The former said his Special Envoy’s task was to bring about peace and reconciliation. The latter said present and past developments would be discussed and made clear that the TRC “would be the last thing in the dialogue.” It became clear this week that the TRC is the one thing and the only thing. How then did this transformation occur and what does it portend? The answer seems to lay in a remark a very close associate of President Rajapaksa and a parliamentarian made to a cabinet minister last Monday. The man who is thoroughly familiar with the workings of the EAM declared, “Meka Gil Pappagey Vedak ney (This is Gil Pappa’s work), referring to his guru of sorts Minister G.L Peiris. For many months he (Peiris) had been engaged in a secret dialogue with Geoff Doidge, South Africa’s envoy in Sri Lanka, about a role for Pretoria in the country’s peace and reconciliation process. Whilst Peiris was pushing that initiative through Doidge, within sections of the Government storm clouds were building on why a third country was being invited. This was after mediation efforts by India and then Norway. It was in this backdrop that Rajapaksa held talks with Zuma on the sidelines of the Commonwealth Heads of Government Meeting (CHOGM) in Colombo in November last year. It is no secret that Doidge was removed from President Zuma’s cabinet amidst serious allegations of corruption, charges that he denies. At that time, Zuma had said he was posting him to Sri Lanka as High Commissioner to spearhead a process to bring peace, a rewarding way for him to make a political comeback. In his new role, Doidge was guided by Peiris and told to remain silent. Colombo-based diplomats familiar with his role said he had alienated powerful sections of the Asian missions through what they alleged was his ‘dubious’ conduct. The missions in question were not taken into confidence and briefed on developments periodically, they alleged. The only exception was when Doidge asked the TNA to brief the diplomatic community at a private dinner after its visit to South Africa. When asked by the media of the event, Doidge said there was no such thing. The three most significant events during Ramaphosa’s visit were official talks with a Sri Lanka Government delegation, the Tamil National Alliance (TNA) and the meeting with President Mahinda Rajapaksa. At first, Rajapaksa had a one-on-one meeting with Ramaphosa. Thereafter, their respective delegations joined the dialogue before sitting down to dinner. The fact that two highly placed dignitaries of the UPFA Government – Economic Development Minister Basil Rajapaksa and Defence Secretary Gotabaya Rajapaksa – did not take part in the official level talks is indeed significant. Their names were on the list of participants handed to the South African side. Though reasons were given for their absence, there is little doubt they would not have wanted to be involved in that dialogue in the current political climate and ahead of impending presidential elections. That naturally downgrades the importance of the exercise. Led by Minister Peiris, the Sri Lanka delegation comprised Nimal Siripala de Silva, Douglas Devananda, Rauff Hakeem, Faizer Mustapha, Sajin de Vass Gunawardena, Arun Tambimuttu and External Affairs Ministry Secretary Kshenuka Seneviratne. Besides Ramaphosa, other members of his delegation were: Nomainda Mfeketo, Deputy Minister of International Relations and Cooperation, Ebrahim Esmail Ebrahim, Parliamentary Counsellor to the President in the National Assembly, Obeid Bopiela, Deputy Minister for Performance Monitoring, Evaluation and Administration, Roelf Meyer (Defence Minister and later Chief Negotiator for the apartheid regime) and one time member of Mandela’s cabinet, Ivor Jenkins, Consultant, Director at In Transformation Institute, Mohamed Bhubba, Political Advisor and High Commissioner Doidge. At the talks at the Gregory Room at Hotel Taj Samudra, the metamorphosed South African role unfolded. Before it began, media personnel present outside were told to withdraw. Minister Peiris was to outline the UPFA Government’s current position by saying that Sri Lanka wanted to learn from South Africa. “Your invitation must not be an involvement. It should not be seen as our wanting to internationalise issues. We want a friendly sharing of ideas. As regards a political settlement, the Parliamentary Select Committee is the only way,” he said. Ramaphosa who said he “appreciated Sri Lanka’s concerns” was to make clear South Africa’s role was the result of Sri Lanka Government’s invitation. He urged that this position be understood and said his Government would help in every way possible. He added that South Africa abstained from voting at the third US backed resolution on Sri Lanka at the March session of the UN Human Rights Council since it wanted to remain neutral. Minister de Silva, Chairman of the Parliamentary Select Committee, charged that the TNA was intransigent since it did not take part in the Committee meetings. This was even after the Government had agreed to certain changes the TNA had sought. However, he did not identify what these changes were. The remarks were to draw an angry response from Justice Minister Rauff Hakeem. “The Government talks of an inclusive response. It wanted me to play the role of a bridge with the TNA. Yet, we ourselves are not in the PSC,” he declared. He said there was a third dimension, the Muslim factor and yet his party had been left out. Hakeem also had a separate meeting with Ebrahim Esmail Ebrahim. During Ramaphosa’s talks with President Rajapaksa and the South African delegation members, the Sri Lankan President criticised the TNA for not taking part in the PSC. He said the TNA kept on upping its demands. Ramaphosa asked, “What if the TNA becomes reasonable. Will you restart the dialogue?” Rajapaksa replied that he could think about it. The South African special envoy said that protagonists must talk to each other. He said the African National Congress (ANC) remained engaged with the white supremacist F.W. de. Klerk regime. This was ahead of formal talks. “We are here to assist you in South Africa’s stand-alone initiative,” said Ramaphosa. No details of the one-on-one talks between Rajapaksa and Ramaphosa were immediately available. However, a source at the Presidential Secretariat said Rajapaksa explained that in any solution to Sri Lanka’s national question, he would have to carry the views of the majority Sinhala community. A presidential election was possible and the ruling party has to expect its support. Those factors too needed to be weighed in and the President appealed to South Africa to be conscious of it, the source said. That makes clear that forward movement, if any, will not be before a presidential poll. Sampanthan also rejected accusations against the TNA by saying, “We did not abandon the talks. It was abandoned by the Government in January 2012.” His delegation explained to Ramaphosa why his alliance did not take part in the PSC. “It has no representation from any party in the opposition,” Sampanthan said he told Ramaphosa. He added that he had also told the delegation that ministers and leaders who were ruling alliance partners were publicly making statements to diminish the powers contained in the 13th Amendment to the Constitution. It is thus clear that the essence of the South African dialogue this week in Colombo ended only in sounding the Government and the TNA on whether they are ready for bilateral talks under South Africa’s aegis. Rajapaksa has said he would think about it and Sampanthan has given a positive “yes.” This is in the midst of the official Sri Lanka Government position set out in Parliament by acting External Affairs Neomal Perera which speaks of only President Zuma assigning Ramaphosa for “sharing views on the Truth and Reconciliation Commission in order to explore the possibility of Sri Lanka adopting such a mechanism…” It is evident even to the dumbest that the process that has gone on so far lacked transparency, is misleading, will cause acute embarrassment and further dent the UPFA Government’s credibility. Once more, Sri Lankans and the outside world are made to believe one story whilst the reality is another. High Commissioner Doidge also spoke to United National Party (UNP) leader, Ranil Wickremesinghe. He invited a delegation to meet Ramaphosa. The latter asked whether any political party other than the TNA was meeting him. When the answer was a “no,” Wickremesinghe said he would only see Ramaphosa in his capacity as the Leader of the Opposition. The South African leader went to Wickremesinghe’s residence at Fifth Lane, Kollupitiya. Wickremesinghe told Ramaphosa to ensure that the Government does not utilise the South African initiative to side track the Geneva process. He was alluding to the international investigation into alleged war crimes and related issues that are now under way. Wickremesinghe also wanted Ramaphosa to be conscious of the role India has continued to play. The South African delegation flew to Jaffna for a first-hand look. Chief Minister C.V. Wigneswaran was also to request Ramaphosa “to keep in mind” India’s role in “whatever situation.” He also spoke at great length on militarisation of the peninsula and on land issues. 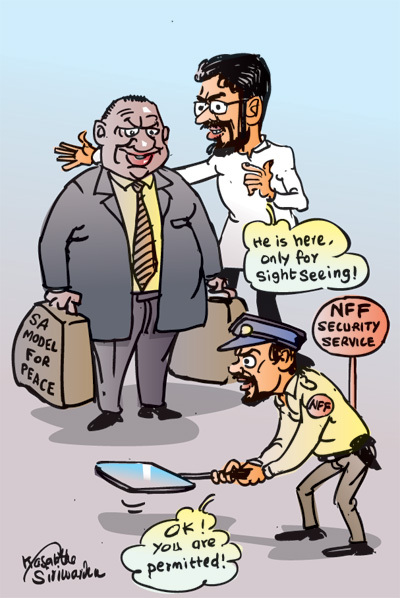 Another unrelated development has pitted the UPFA Government and the TNA on a collision course casting serious doubts over any future political dialogue between them. That is the extension of the term of office of the Northern Province Governor, retired Major General G.A. Chandrasiri. After the September 2013 Northern Provincial Council elections, Wigneswaran, who was sworn in as Chief Minister by Rajapaksa at ‘Temple Trees’ in Colombo, was told that the former Army officer’s term would not be extended. This was after the TNA alleged that the NPC, where it held an overwhelming majority, could not function since the Governor was placing obstacles. On the other hand, Governor Chandrasiri defended his position by saying he was acting in accordance with the law. An incensed TNA is expected to respond to Rajapaksa’s move. Some of the NPC members are pressuring the Chief Minister to resign. The move is also expected to cause concern for the Modi Government in New Delhi. India was on the frontlines of countries that pressured the Rajapaksa administration to hold NPC elections, an exercise under Indian-brokered 13th Amendment. “What we are going to do there, we are going to listen to the Sri Lankans. We have already met them a few times in South Africa, but this time around we are going to go to Colombo and meet the Government, the President of Sri Lanka and a number of other government ministers…. “We will also meet the opposition parties and we will travel to the north where the conflict was at its fiercest. We will discuss with people in the community. We will also try to help the Sri Lankans with the Truth and Reconciliation process, their own constitutional reform and make sure Sri Lanka does indeed become a stable country where they will enjoy human rights…..” Is he wittingly or otherwise saying that Sri Lanka is not a stable country and there are no human rights? Be that as it may, who in the Government does one believe? Minister Rambukwella who says Ramaphosa is a tourist, or acting External Affairs Minister Neomal Perera who claims he is here to share with Sri Lanka the South African experience on the TRC or Cyril Ramaphosa who says a lot more? Of course, the main architect of the latest tragi-comedy on the foreign policy front, External Affairs Minister Peiris, left for India after the Ramaphosa visit. The usual media statement was thus absent. Peiris’ private visit to India did ruffle some feathers but for his luck officials in New Delhi lined up an official meeting with his Indian counterpart Sushma Swaraj. It took place on Friday. If such a meeting was not arranged, he would have met two Chief Ministers, one in Andhra and the other in the newly created Telengana, and returned to Colombo. That in turn would have given justification for India’s External Affairs Minister to travel to Jaffna to meet the NPC Chief Minister and return to New Delhi without seeing her counterpart in Colombo. One could not have protested for not following niceties for Peiris would have set a new precedent. In New Delhi on Friday, Peiris had a two hour long meeting with Swaraj. An External Affairs Ministry spokesperson in New Delhi said they discussed the fishermen’s issue at length and Peiris gave a detailed presentation on the peace and reconciliation process in Sri Lanka. He said Peiris sought a fast track process to resolve issues related to fishermen of both countries. “All substantive issues were discussed. It also covered an investment of a million dollars by a Sri Lankan firm in a project in Vishakapatnam,” he said. Though not formally announced, Swaraj, according to authoritative sources in New Delhi, also raised issue with Peiris, over a decision by the Government to allow China National Aero-Technology Import-Export Corporation (CATIC) to establish a US$ 40.3 million (over Rs. 5.15 billion) for Aircraft Base Maintenance Centre in Trincomalee. This is to service some 34 Chinese-built aircraft in the Sri Lanka Air Force (SLAF) inventory. This was revealed exclusively in these columns last week. The project which aims at producing indigenous aircraft will also provide for a large housing block in the picturesque Marble Beach to accommodate Chinese crew. The Indian contention is that the decision, taken on May 29, violates the Indo-Sri Lanka Accord of 1987. The move came on a recommendation to the cabinet of ministers by President Mahinda Rajapaksa, who is also the Minister of Defence. The same sources said Swaraj accepted Peiris’ invitation to visit Sri Lanka. During the briefing on ethnic reconciliation, Peiris has told the Indian Extternal Affairs Minister that the TNA was not taking part in the PSC. He sought India’s support to get the TNA to take part. She had sought to hear from the Government its own proposals before her possible visit, the sources said. Weeks earlier, the cabinet of ministers gave further approval to a recommendation by Economic Development Minister Basil Rajapaksa to continue advertising in buses in Beijing, Shanghai, Guangzhou and Chengdu. According to Rajapaksa the bus advertising campaign has led to the increase of tourist traffic from China. Hence the Sri Lanka Tourist Promotion Bureau wants to continue the promotional campaign in 200 buses in the four principal Chinese towns. Minister Rajapaksa has said that since August last year 54,258 tourists from China have come here as a result of the campaign through an advertising agency there at a cost of Yuan 14 million (or more than Rs. 293.72 million). Hence, he sought approval to spend Yuan 6,102,000 (over Rs 128 million) to extend it until August this year. It was just last week Minister Rajapaksa returned to Sri Lanka after a visit to China. He was accompanied by Treasury Secretary P.B. Jayasundera. UPFA sources say they have wrapped up attractive financing deals for high end projects and paved the way for a Free Trade Agreement. The deals are to be announced and the FTA signed when Chinese President Xi Jinping visits Sri Lanka possibly in December. That no doubt would be a grand curtain raiser for a presidential election likely in March next year. Even if the South African safari is now almost over, the international isolation of Sri Lanka continues. It is Dale Carnegie in the reverse – how to lose friends and influence disaster.